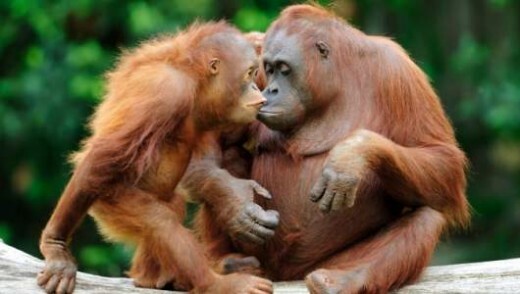 Scientists have found that orangutans have a sense of empathy and mimicry which forms an essential part of laughter. As orangutans and humans are 96.4% the same genetically and share 28 distinct physical characteristics, it’s no wonder this magnificent creature’s name means person of the forest in Malay. There are two separate species recognised depending on physical characteristics and where they live, the Sumatran Orangutan (Pongo abelil) and the Borneo Orangutan (Pongo pygmaeus). Sumatran Orangutans are thinner than Borneo Orangutans and have a paler, longer red coat and a longer face. Orangutans diverged from the other apes over 10-16 million years ago. They are more arboreal (tree-dwelling) and more solitary than all the other great ape species. Orangutans have been shown to display individual personalities. Orangutans are renowned for their high intelligence. Their use of tools even extends beyond foraging and nest building. Wild orangutans (P. pygmaeus wurmbii) in Tuanan, Borneo, were observed using tools to aid acoustic communication, using leaves to amplify their ‘kiss-squeak’ vocalisations. It is believed that this is done in order to deceive listeners into thinking that they are larger than they really are. Orangutans have one of the most prolonged developments of any mammal. Young orangutans are highly dependant on their mother’s love and care for survival, and for the first few years of life they hold on tight to their mother’s body as she makes her way through the forest canopy. Male orang-utans may not develop the fatty cheek pads that characterize full adulthood until they are between 15-19 years old. Females will have their first infant between 12-15 years of age and only give birth every 7-8 years after that. This low reproductive rate means populations are highly susceptible to the rapid habitat deforestation that has taken place over the last few decades. Both species are currently considered highly endangered. Diet in the wild consists mainly of plants and plant parts (fruit, seeds, leaves, bark and flowers) but animal prey such as insects, eggs, birds and small mammals are also eaten. At one study site in Ketambe, Sumatra, female orangutans were seen to kill and eat slow lorises. One population of Sumatran Orangutan found in a lowland swamp has been documented to modify and use sticks as tools in order to obtain honey and insects from holes in trees. They also use stick tools to remove seeds from fruits with stinging hairs. Orangutans have an enormous arm span with a potential reach of 8ft, which are well suited to fit their lifestyle of living in trees and suspending themselves from branches to feed. The male long call, a long series of reverberating grunts, can carry over 1km through the forest canopy and is used to signal a resident males location. Orangutans in the care of humans have been taught American Sign Language, one orangutan called Chantek learned to use over 150 different signs. Orangutans are also very good observers of human behaviour, in rescue centres they will often imitate the activities of their human carers such as washing clothes, rowing boats and hammering nails into wood. Range: Indonesia and Malaysia, in the islands of Borneo and Sumatra.